Shubert Ticketing will combine the power and security of its ticketing system with Patron Technology’s innovative PatronManager CRM system, providing its clients and venues across the country with an integrated platform for building and managing customer relationships, cultivating season subscribers, and boosting the capabilities of Shubert’s robust reporting and analytics tools. We are thrilled about how our partnership with Shubert Ticketing, the leading ticketing company on Broadway, will encourage even more organizations to revolutionize their operations by adopting CRM. Shubert Ticketing and Patron Technology are pleased to announce that they have signed an agreement to form a strategic alliance to benefit their clients. This arrangement will enable Shubert Ticketing to combine the power and security of its ticketing system with Patron Technology’s innovative PatronManager CRM system, providing its clients and venues across the country with an integrated platform for building and managing customer relationships, cultivating season subscribers, and boosting the capabilities of Shubert’s robust reporting and analytics tools. The integration of PatronManager CRM with Shubert Ticketing will allow Shubert Ticketing’s clients to streamline their subscription ticketing programs, seamlessly integrating Shubert’s expansive API inventory with customer data, preferences, and purchase history. Not-for-profit clients can also take advantage of PatronManager CRM’s comprehensive fundraising capabilities. 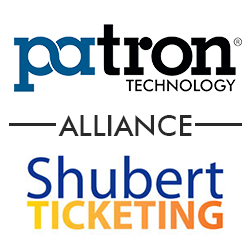 Through this Alliance, Patron Technology’s clients will have access to Shubert Ticketing’s unsurpassed distribution network, and will obtain the global ticketing reach of Shubert’s brands, including Plum Benefits, Telecharge, Broadway Inbound, and Audience Rewards. ABOUT SHUBERT TICKETING: Shubert Ticketing is a division of The Shubert Organization and a leading provider of ticketing services nationwide. At the forefront of the ticketing industry, Shubert Ticketing delivers innovative solutions for private label clients and users of its Telecharge box office, call center, and online technology. Drawing upon over 100 years of experience in live entertainment and venue management, Shubert Ticketing provides users of its ticketing systems with unrivaled flexibility and client support. ABOUT PATRON TECHNOLOGY: Patron Technology was founded in 2001 by industry veteran Eugene Carr. PatronManager CRM, a 100% cloud-based system built on the force.com platform and in partnership with the Salesforce Foundation, integrates box office ticketing and subscriptions, donor database management, email marketing, and staff collaboration. Launched in 2010, PatronManager CRM now serves over 400 organizations that use the system to sell more tickets, provide better patron service at the box office and beyond, target their marketing and fundraising efforts more effectively, and make their organization more efficient. PatronMail, its first flagship product, is used by over 1,500 organizations across the U.S. and abroad. In 2011, Eugene Carr and Michelle Paul (Patron Technology’s Director of Product Development) co-authored and published Breaking the Fifth Wall: Rethinking Arts Marketing for the 21st Century. In addition, the company presents a regular schedule of live e-marketing seminars across the country, monthly email newsletters, blogs, and live educational webinars.